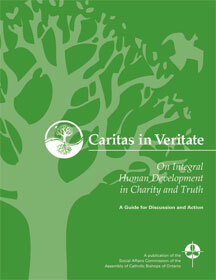 This guide, created by the Jesuit Forum for Social Faith and Justice at the request of the Assembly of Catholic Bishops of Ontario, is designed to facilitate small group study and discussion of Pope Benedict XVI’s encyclical letter Caritas in Veritate. The guide is intended for use by parishes, secondary schools, colleges and universities, union, NGOs, professional and business associations, as well as by any group or individual interested in learning about the Church’s social teaching. The seven session format seeks to present in user-friendly language a biblical and practical appreciation of the Encyclical’s central theme and questions. Caritas in Veritate. Sur le développement humain intégral dans la charité et la vérité. Guide pour discussion et action.